Being wife, mom, enterprenuer, foodie... requires a lot of engagement, but I have decided to find more time for some special occasions. Easter in Dubrovnik is one of my family favorite holidays because it announces rebirth and renewal in nature and our lives. Spring is all around us and it brings us together and prepares us for new challanging activities. And of course, in our case, the gathering takes place around the table. The first challenge – painting the eggs in a traditional manner. It can be easy for someone who has a lot of practice but when my husband takes a main role, it can get awkward. He needs: real beeswax ( already arranged with my mother to bring it), a pin, calm hands (). It takes a lot of patience. Beeswax needs to be melted in a tiny bowl on the fire. With the pin dipped in wax paint different motives onto a raw egg shell. Usually those are gentle love notes because eggs are given as a gift to those we care about. In the past, after painting the eggs with wax, women used herbal roots of the plant known as broč (wild madder) to get a dark red color. 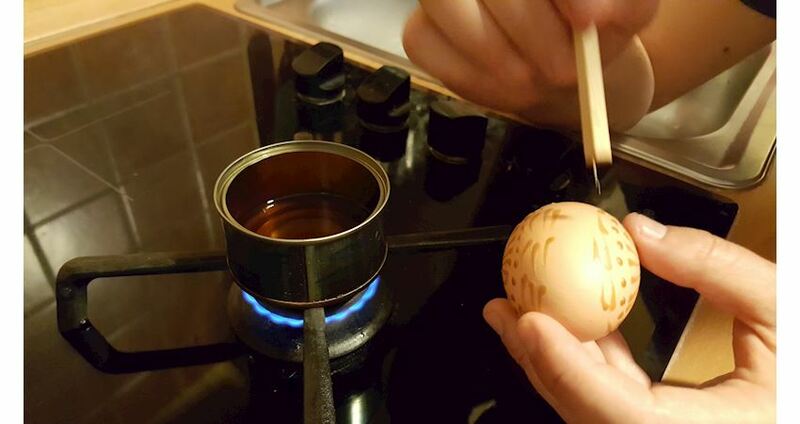 Today, red onion shell is put into cold water and eggs are then added and cooked in it for 15-20 minutes. They get a dark orange or light brown color. While cooking in this colored water, beeswax melts leaving motives as on a work of art (especially of my husband'ss Picasso-like motives) He chose to use his favorite note and paint in on the egg: Ovo jaje našarano fino, nek se pije rakija i vino A free translation of the sentence would be: This egg is painted nicely, let's drink grappa and wine The second challenge –making a homemade traditional Dubrovnik sweet bread called pinca. I've never done it before but I decided to give it a try. To make it more easy I will adapt a traditional version with the help of the modern kitchen appliance – the breadmaker. In the past time cooks had to knead the dough several times during the night so it would be ready for baking on Easter morning. Dubrovnik Sweet Bread (Pinca ) – recipe Ingredients: 125 ml lukewarm milk 125 g butter 3 eggs 3 tbsp rum 200 g sugar 2 tsp vanilla sugar 1 lemon zest 1 orange zest Pinch of salt 100g raisins ( optional) 500g all-purpose flour 2 packages of dry yeast For the icing : one egg, 1dl white wine, 3 tsp sugar Mix eggs, soft butter, vanilla sugar, sugar, pinch of salt, zest of lemon and orange. Add rum. Put ingredients in the breadmaker in the following order: 1)	milk 2)	mixture 3)	flour 4)	raisins (optional) 5)	dry yeast In the pastinstead of rum people used rose water or a few drops of rose extract to give a special flavor to the sweet bread. Housewifes bought it in the farmacy in the Franciscan monastery in the Old town. Put a program to dough making (in my breadmaker it takes 1 hour and 19 minutes). When it is finished, take it out and knead the dough once more adding flour to get a soft medium dough. Form 2 or 4 smaller round shape buns and put them on a baking tray to raise for 2 hours until they double in size. Make sure they are not too close to each other. When the dough has risen enough, cut a 'cross' in the top of each bun using a knife or clean kitchen shears and brush them with beaten egg before putting them the oven. Preheat the oven to 170 degrees Celsius and bake it for 30-40 minutes. When the buns are baked, brush them with a mixture of wine and sugar to make them more moisturized and soft. Enjoy your Easter and share your time with the family as some things cannot be bought with money.